Public transport is always popular with travellers wishing to explore West Java, and the ease of getting around Banten really does depend on where you are intending to travel. A number of buses regularly connect the main places of interest around Cilegon, Lebak, Pandeglang, Serang and Tangerang. 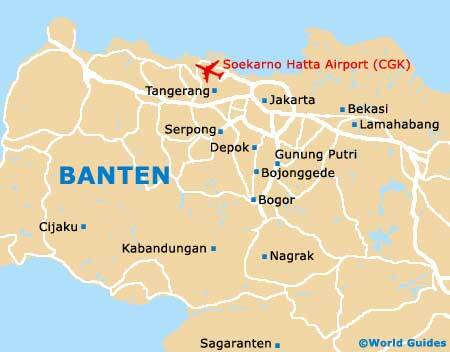 Banten is a major transport hub for West Java, since it is home to the Soekarno Hatta International Airport. This enormous airport serves not only Banten, but the neighbouring city of Jakarta, being easy to travel to by bus or taxi. Soekarno Hatta International Airport is located some 19 km / 12 miles to the north-west of central Jakarta. The airport actually lies just across the border, in the city of Tangerang, Banten. Sometimes referred to as Banten Airport, Soekarno Hatta Airport currently handles around 35 million passengers each year and is home to four terminals. More than 40 different airlines currently operate here, offering domestic flights throughout Indonesia, as well as international flights to destinations such as Australia, China, Germany, Japan, Netherlands, North Korea, Philippines, Singapore, Thailand, Turkey and United Arab Emirates (UAE). The main domestic airports are Lion Air, Merpati Nusantara Airlines and Sriwijaya Air, which travel between Bali, Kalimantan, Lombok, Maluku, Papua, Semarang, Solo, Sulawesi, Sumatra, Sumbawa and Yogyakarta, amongst other Indonesian cities and islands. Car rental is big business at Soekarno Hatta Airport and a huge choice of hire companies await, both national and international, with the Jakarta-Tangerang highway being conveniently close by. In general, the roads around West Java are in good condition and renting your very own car does give you the freedom to properly explore the spreading province on Banten. From Jakarta, the beach resort of Anyer is approximately two hours away by car, while Labuan (Labuhan) is close to Anyer and directly to the south. Book your Jakarta Car Rental here. As well as regional public bus transport, mini shuttle buses (angkots) are also in use in cities around Banten, being mainly used to travel short distances. From Merak, frequent buses travel to and from Jakarta's Kalideres bus station, with this journey taking up to three hours for standard buses, and just two hours for express buses. Buses from Merak also run to Bogor, Bandung, Borobudur, Kampung Rambutan and Pulo Gadung. Public taxis, 'ojek' motorcycle taxis and 'becak' bicycle rickshaws are available around Banten and used to cover short distances, between hotels, attractions and other places of interest. Official taxis should always use a meter to calculate the fare, and if the driver insists on charging a fixed price, it is often best to find yourself another taxi, to save unnecessary expense. Taxis are in particularly good supply at Soekarno Hatta Airport and are perfect for those wishing to travel into nearby Jakarta. Located on the very north-westerly tip of Banten, in the Cilegon area, the port city of Merak offers a choice of ferry transport. From Merak's harbour, ferries regularly sail to Bakauheni in Sumatra roughly every 30 minutes, departing both day and night, with a journey time of around two hours. A good alternative is the high-speed Dermaga express ferry, which is for passengers only and makes the same crossing in just 45 minutes.